These delicious little treasures are the perfect recipe for St. Patrick’s Day! 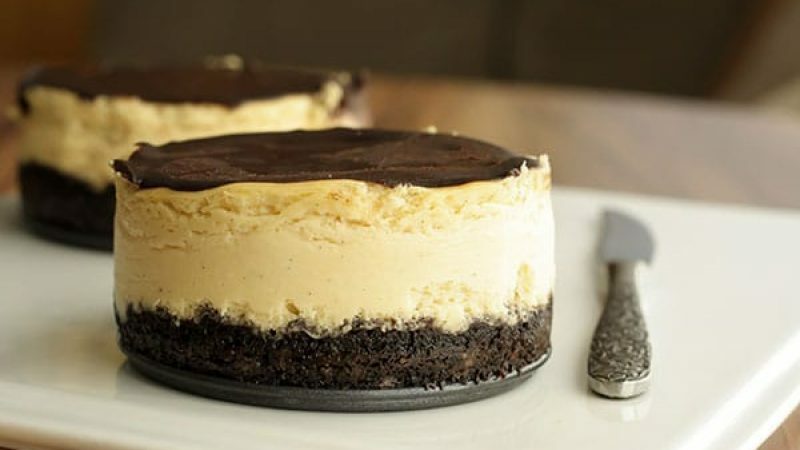 So rich and creamy, made with all of our staple ingredients and a little Irish Cream Liquor! Tear off 6 8-inch pieces of aluminum foil. Fold them in half. Place the springform pan in the center of the foil and wrap the foil up, around the outsides. Crimp pieces around the side of pan, making sure it is tight, so no water gets in during the baking process. Complete with all springform pans and layout on a deep baking sheet or large roasting pan. Combine cookie crumbs and butter together in a bowl. Evenly distribute the crumbs into the springform pans, and press into the bottom to create the crust. Bake for 10 minutes. In the bowl of a stand mixer with a paddle attachment, beat cream cheese, sugar, and scraped Rodelle Vanilla Bean seeds together until smooth. Beat in eggs one at a time, and scraped down bowl after each egg. Beat in Irish Cream, sour cream, and Rodelle Vanilla Extract. Continue beating on medium speed until smooth and silky. Pour over cooled crusts, portioning evenly between six pans. Making sure springform pans are still on deep baking sheet or large roasting pan, place back in oven. Pour the boiling water onto the baking sheet or into the roasting pan (maximum water height- half way up the springform pan). Quickly close the oven door. Bake 45-55 minutes, or until cheesecake has set (the middle will still be soft). Turn off oven, keep oven door closed, and allow cheesecake to cool for 1 hour. Remove cheesecake from oven, then carefully remove springform pans from water-bath. Remove aluminum foil, and chill in refrigerator overnight. Melt shortening in a glass container in microwave. In a small bowl, combine Rodelle Gourmet Baking Cocoa, powdered sugar, and Rodelle Vanilla Extract. Pour the melted shortening over the cocoa mixture and whisk well to combine. Heat the cream in a small pot over medium heat until it simmers. Strain the cream over the cocoa mixture. Let set for 5 minutes, then whisk until smooth. Let it set up for 10 more minutes, then whisk again. Spoon ganache evenly over the tops of the cheesecakes. Refrigerate for at least an hour. To remove from springform pans, use a knife to gently loosen the cheesecakes. Remove the sides of the pan.